The Add All Associated Surfaces to Map command works similar to the Add All DEM Surveys command, but only adds the Associated Surfaces. Note this command does not add DEM or error surfaces. This is a convenient command if you want to add your symbolized Associated Surfaces to the map quickly. 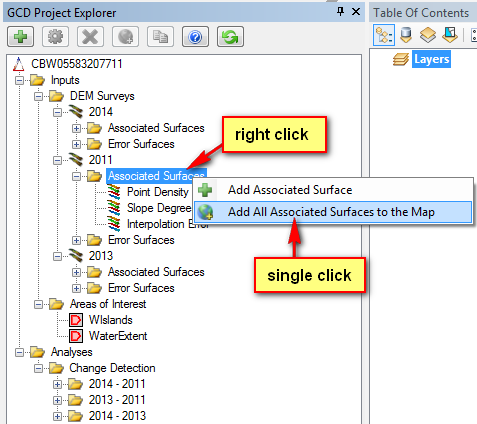 To access the Add All Associated Surfaces to Map right click the Associated Surfaces node in the GCD Project Explorer and single click the command, as is shown in the image below.